An important objective of clinical research is to ensure that marketed drugs are as safe and effective as possible. When a promising drug is discovered, a pharmaceutical company will plan a clinical development programme involving several phases of clinical research. Each phase will involve at least one clinical trial or trial, sponsored by the pharmaceutical company responsible for the drug to be tested.CRAs are involved in all phases of clinical research and at all stages of a particular trial.Therefore, possible CRA duties include most of the activities required to set up, monitor and complete a clinical trial. A new CRA is most likely to be involved in the initiation,monitoring and close-out of a selected group of investigational sites. Recruitment of CRAs may be directly into a pharmaceutical company or into a Contract Research Organisation (CRO) which can plan, organise and/or conduct clinical trials on behalf of pharmaceutical companies. This booklet aims to provide ideas, information and guidance to those who might be interested in becoming a CRA, either within the Pharmaceutical Industry or within the Pharmaceutical Service Industry. 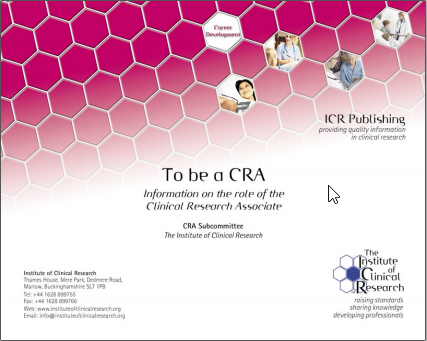 Existing CRAs and colleagues may wish to give this booklet to those who express an interest in the CRA role. Careers Advisors, recruitment and Human Resources may wish to use this booklet to provide information, in a concise and relevant form, to those actively seeking a CRA osition.